Welcome everyone to THE EARFUL, a delicious piece of new content from the minds over at the OH NO RADIO SHOW. This bonus show will feature a countdown of songs we have been enjoying within our ONRS community giving you all a taste of musical variety and maybe even turning you onto to something you'll like! We hope to do these shows often and would love your feedback and input as well on what we should be listening to. 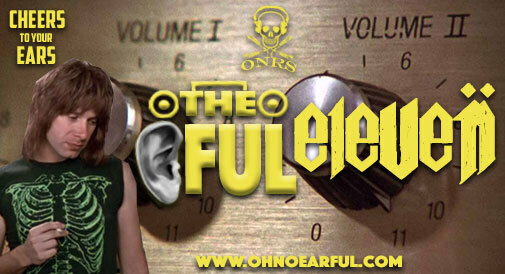 With out further adeau we give you EARFUL ELEVEN. So turn it up all the way and commence face melting. The Underachievers are an American hip hop duo from Flatbush, Brooklyn, New York. Formed in 2011, the duo is composed of rappers AKTHESAVIOR and Issa Gold. Formally Death from above 1979 - now the band just goes by Death From above sans 1979. !!! is a dance-punk band that formed in Sacramento, California, in 1996 by lead singer Nic Offer. Members of!!! came from other local bands such as The Yah Mos, Black Liquorice and Popesmashers. Delux is a pop rock band formed in Tijuana, Mexico, in the summer of 2000. The group is influenced by 1980s new wave music and the SoCal punk scene. Baaba Maal is a Senegalese singer and guitarist born in Podor, on the Senegal River. He is well known in Africa and internationally is one of Senegal's most famous musicians. In addition to acoustic guitar, he also plays percussion. This entry was posted on Monday, June 26th, 2017 at 7:09 pm	and is filed under DefaultTag.